In this great two-day class you’ll learn the basics of urban sketching from illustrator Chandler O’Leary, the co-creator of The Dead Feminists Broadside series and the genius behind Anagram Press and Drawn the Road Again. Participants will expand their outdoor sketching skills by choosing an outdoor location, composing a scene, developing a line drawing and adding finishing touches with watercolor. On day one we’ll meet at Antenna, cover some basic drawing and watercolor techniques, then sketch as a group in the neighborhood around the gallery. 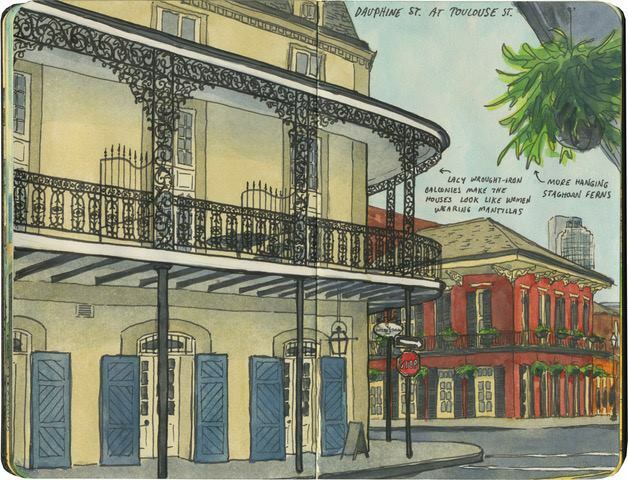 On day two we’ll meet in Jackson Square for a day of sketching and instruction on location in the French Quarter. No experience necessary; bring your own sketching supplies (a suggested list will be provided to workshop registrants). Workshop fee is $110: register here! Chandler O’Leary was born 50 miles west of Wall Drug—so naturally, she has a thing for roadside attractions. She is a graduate of the Rhode Island School of Design (RISD), and has been keeping sketchbooks for over 20 years. She is the author of the illustrated travel blog, Drawn the Road Again, which features full-color sketches of crazy roadside kitsch, Americana, architecture and landscapes around North America. Chandler lives in Tacoma, Washington, and works full-time as an illustrator, writer and lettering artist. She is currently working on an illustrated road trip atlas of the West Coast, to be published by Sasquatch books in spring 2019.